Budgett’s Frogs (Lepidobatrachus laevis) sometimes known as Hippo Frogs or Freddy Krueger Frogs are becoming increasingly popular pets; the somewhat comical appearance of these large bodied, big mouthed frogs makes them an attractive prospect to many hobbyists. 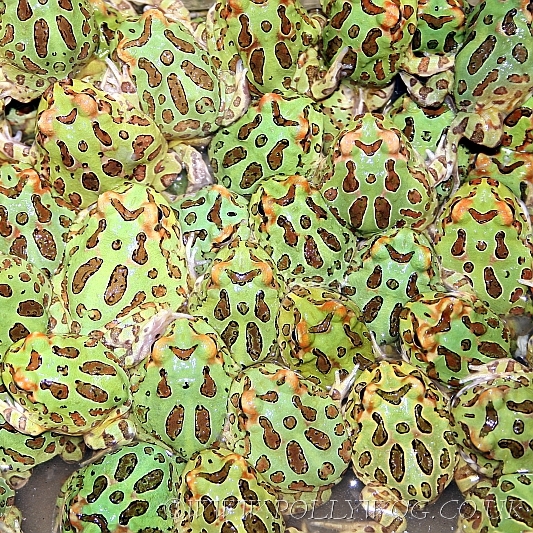 However even today with the world wide web there is still little information to be found on their captive care requirements – care requirements that in order to keep these frogs healthy for their life expectancy of more than 15 to 20 years should mimic the seasonal changes found in their natural habitat. These seasonal changes can be quite complex and recreating them in captivity contains some degree of risk, care for these frogs can be a real undertaking for the hobbyist. 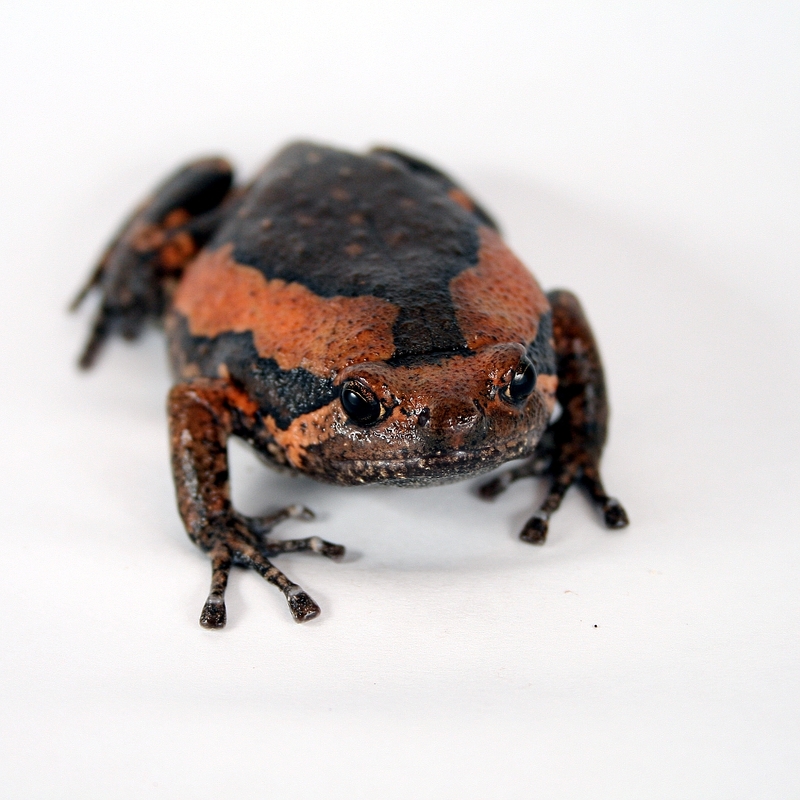 First described by it’s name sake John Samuel Budgett in 1899 the Budgett’s Frog originates from the Gran Chaco; a relatively dry region of South America stretching from the South Eastern corner of Bolivia into Western Paraguay and southward into Argentina as far as Santa Fe. Budgett’s grow to an average adult size of 3.5 to 5” (9 to 12cm) with exceptional examples reportedly reaching 6” (15cm), they share many similarities with the other members of the Ceratophryinae family which includes two other species of Lepidobatrachus and the closely related Horned Frogs (Ceratophrys & Chacophrys). A loose blue-grey vocal sac and nuptial pads that develop during the breeding season can distinguish adult males as can the piercing shriek they make to advertise their presence to any potential mates in the area. During the wet season these sit and wait predators can be found feeding and breeding in temporary pools formed by the heavy rains. Their large flattened, grey coloured body is marked with irregular olive spots that become a more apparent reddish brown after dark, the underside is pale cream to white in coloration and unmarked. The limbs are short and the hind feet webbed, their eyes are positioned on top of the head allowing them to rest in shallow water with just the eyes protruding above the surface waiting for unsuspecting prey to pass by. The eyes of young animals are surrounded by a green coloration that extends down the back as additional camouflage, this usually fades away in adults but will be kept by some. Budgett’s in the wild prey largely on other frogs that share the same temporary breeding pools as well as large insects found at the waters edge. If confronted by a predator while in water they will quickly burrow down into the mud and silt but if confronted by a predator while on land they put on a show of aggression inflating themselves and raising up on all four limbs making themselves look as large as possible. If this is not enough to deter the approaching predator they will begin to lunge forward, mouth agape, biting and squawking in an attempt to drive them away. As the winter nears and the pools dry up Budgett’s use their hard metatarsal tubercle spade to burrow into the mud where they avoid desiccation during the dry months by encasing themselves in multiple layers of dry skin. They remain cocooned like this until the warm rains return allowing them to come back to the surface to feed and breed once again. Despite being such large frogs Budgett’s do not require huge enclosures, this is a big advantage when maintaining more than one of these frogs, as they should ideally be kept separately to avoid potential cannibalism. Juveniles are especially cannibalistic and wont hesitate to take a munch on their tank mates, adults show less of a tendency to cannibalise and adult animals of similar size may be kept together successfully if well fed, however the risk is always present. Usually the Budgett’s found in pet stores are juveniles measuring approximately 1.5 to 2.5” (4 to 6cm), at this size they can be maintained in enclosures of 12x10x10” (30x25x25cm) with a water depth of 2 to 3” (5 to 7cm) that as with all amphibians should be dechlorinated before use. An average sized adult can be happily maintained in a glass aquarium of 24x12x15” (60x30x40cm) with a water depth of 6 to 9” (15 to 22cm). Contrary to popular myth these frogs are good strong swimmers and water of up to 12” (30cm) depth will be no problem to an adult. Budgett’s kept in cool water will feed poorly and are more likely to develop illnesses, ideally a temperature of 77 to 82°F (25 to 28°C) should be maintained using an aquarium heater with built-in thermostat. The swimming and digging actions of the frogs can easily dislodge heaters from their mountings and so it should be guarded to prevent damage and choosing a heater with an automatic cut-out is also wise incase it is accidentally moved above the water line. These frogs seem comfortable with a wide range of water parameters but special attention should be paid to keeping the water clean. Filtration is advised but should cause little water movement and minimal disturbance to the animals, air powered box filters set to bubble gently are a good choice for young animals but for adults an internal or external power filter will be required with the outlet diffused by a spray bar. Budgett’s produce large amounts of waste and so the better the filtration system you have in place the less maintenance will be required and water changes can be kept down to a minimum. Artificial lighting is not strictly necessary but will help give your frog a defined day/night cycle, the provision of UVB or other special lighting is not required so a low wattage fluorescent tube designed for freshwater aquaria set on a 12 hour cycle will do nicely. Providing a light will also help to keep any plants alive. Substrates such as gravel or sand are not advisable as ingestion of substrate is common and having no substrate also aids in cleaning. Décor in the form of rocks, driftwood, terracotta pots, and plastic pipes should be arranged to provide hiding places and terraces in the aquarium so the frog can choose a suitable resting position at it’s preferred water depth. Any décor used should be too large for the frogs to swallow, many keepers are surprised by how large a pebble or aquarium ornament can be swallowed whole resulting in a rather costly trip to the vets. 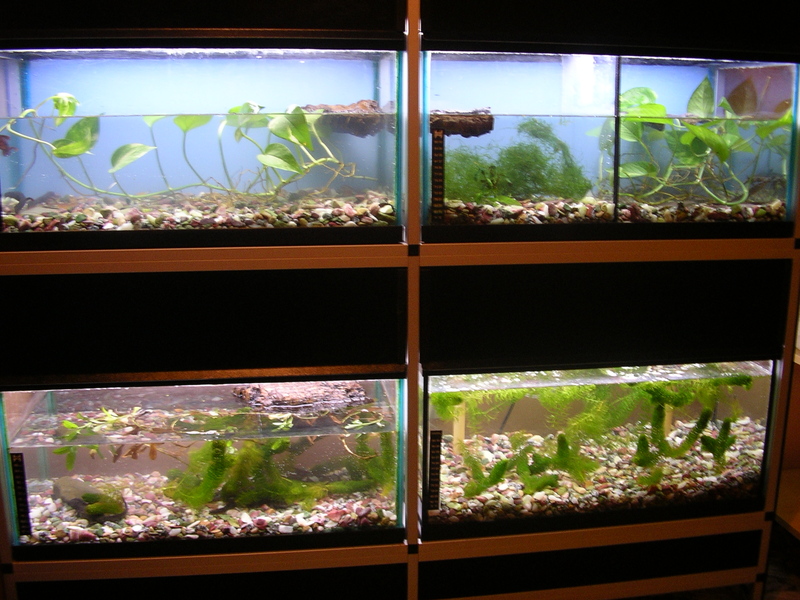 Hardy aquatic plants such as Amazon Sword and Java Fern, along with cuttings of hydroponically grown Devils Ivy can also be used to further decorate the aquarium. A platform allowing the frog to completely leave the water should also be provided. Young Budgett’s should be offered food daily with the diet consisting of a mixture of live insects including earthworms, crickets, roaches and wax moth caterpillars, small live-bearing fish may also be fed from time to time to providing additional variety in the diet. Adult Budgett’s can be fed less often only requiring a good meal a couple of times a week; suitable foods include large Lumbricus worms, locusts, roaches, and de-shelled African Land Snails. Fishy foods such as prawns, sardines, white-bait etc. may be offered to provide some additional variety, fish must be warmed to destroy the thiaminase enzyme and allowed to cool before feeding. Budgett’s will eat both in and out of the water, live foods may be placed on the land platform or dropped onto the waters surface, inanimate prey may be offered by tongs. Be careful when putting food into the enclosure as these frogs are aggressive feeders and will often launch themselves out of the water to catch their approaching prey, a bite will hurt and will often draw blood. Usually a couple of days after feeding the frogs will defecate, when faeces is noticed in the water it should be siphoned out immediately and a partial water change carried out. Pre-killed Rodents may be fed from time to time but Budgett’s fed large numbers of Rodents tend to be sluggish and lethargic, if feeding rodents aim for a hairless strain of mouse and wait for the frogs to defecate before feeding again – this could be 10 to 14 days after a large meal. I advise hairless mice over regular mice, as the undigested fur is a nightmare to clean from the aquarium and can result in the aquarium requiring a full strip-down and thorough clean. Growth of young Budgett’s is rapid potentially reaching a near adult size in as little as 6 to 9 months, due to this rapid growth they require a good supply of calcium and vitamin D3 in the diet to ensure healthy bone development. Ideally a high quality calcium & vitamin supplement should be dusted over the food at every other meal and then cutting down the frequency of supplementation as they mature. Although some Budgett’s owners disagree I believe that for best health it is important to allow them to aestivate each year as they would in the wild. 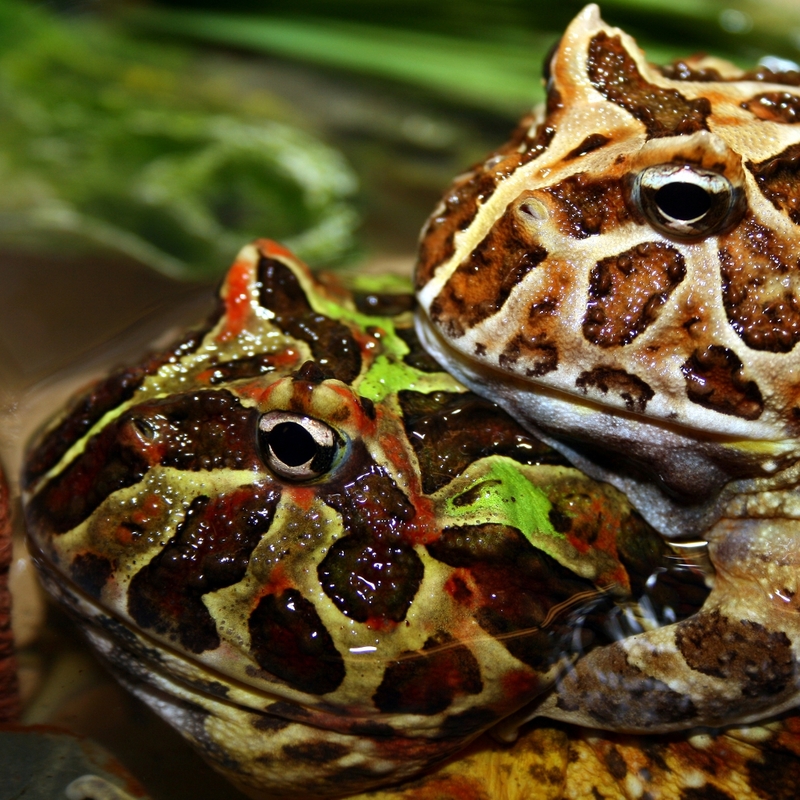 Budgett’s that are not allowed to aestivate yearly are typically more prone to developing respiratory problems – but be warned, aestivation comes with it’s own dangers and only frogs in the best possible health should be subjected to the stresses involved. It is usually easiest to time the frogs’ aestivation period to coincide with our winter when it is easier to provide the cooler temperatures required. However quite often the frogs themselves will tell you when they are ready; a loss of appetite, and spending more time out of the water are common signs of this. To prepare the frogs for aestivation they should be fed heavily to ensure they are carrying sufficient fat reserves to last the winter and then starved to ensure their guts are completely empty before entering aestivation. During the aestivation period the frogs metabolism and digestive system will slow down greatly and any food left in the gut could potentially rot ultimately causing the death of the frog. Slowly begin to lower the water in the aquarium over a period of 2 to 3 weeks until the level has reached a couple of inches and then begin to add some substrate to one end of the aquarium in which the frog can dig. My preference is for a coconut fibre based substrate as I find it easier to maintain the all important moisture levels during the aestivation, other suitable substrates include sedge peat and sphagnum moss or a blend combining any of the above. Continue to lower the water level until all of the water has been removed from the aquarium. At this point fill the tanks with slightly moistened substrate lightly compacted to a depth of 12” and gradually lower the temperature to the high 60’s to low 70°F’s (the low 20°C’s). With this relatively dry environment and lower temperature the frogs should begin to burrow, if they remain at the surface don’t panic just yet as some individuals won’t start to burrow until the temperatures are reduced further. You should provide a small shallow bowl of water kept clean and full, choose a heavy bowl to prevent it being tipped with the burrowing actions of the frogs. Continue to gradually lower the temperature until all frogs have burrowed fully, most Budgett’s will have burrowed by the time the temperature reaches 59°F (15°C), if by this time they still refuse to burrow they should be transferred back to an aquarium and returned to normal conditions. Once completely buried you can slowly let the substrate dry further, gently turning the substrate from time to time while being careful not to disturb the frogs will help with the drying process. As the moisture content of the substrate lowers the outer layers of the frogs skin will begin to dry and harden and they will cocoon themselves inside these layers of skin to prevent water loss. You must check on each Budgett’s Frog regularly gently uncovering them slightly and checking for signs of life as any frogs that have not cocooned themselves properly may quickly desiccate. Be careful to avoid sudden temperature fluctuations and continue to provide a shallow bowl of fresh water incase the frogs wake prematurely, any that do surface early will require re-hydrating and warming. The aestivation period can last from several weeks for juveniles to several months for older individuals. Once you feel sufficient time has passed and you are ready to wake your Budgett’s from its slumber begin by raising the temperature and slowly start to re-hydrate the substrate in the enclosure by adding warm water. Do this gradually to mimic the water from the onset of summer rains filtering down into the soil. As the frogs awaken they will be unable to move until the hard dry skin cocoon has begun to soften allowing them to shed it completely and make their way to the surface. If the frogs do not surface of their own accord they should be dug up and moved to a small tank containing a couple of cm of warm water, spray them gently at regular intervals to aid with the rehydration and shedding of the dry skin. At this time the Budgett’s will shed and urinate profusely and so the water will require changing regularly to keep it clean. For the first week continue to keep the frogs in shallow water and after a few days you may start to offer food. Begin by offering only small amounts of live foods, most frogs will be reluctant to feed at first but as you gradually flood the tank and return everything back to normal their appetite will return. After following the above guide lines for aestivation you may notice male Budgett’s coming into breeding condition, the loose dark skin of the throat will drop and nuptial pads will develop on the inside of the first digit. They will choose a position in the aquarium where they can stand with their head just above the surface of the water to emit their loud squawking call. Females usually take a little more conditioning to prepare them for breeding. If you are lucky enough to achieve a successful breeding be prepared for lots of work rearing the hundreds of carnivorous and cannibalistic tadpoles and resulting froglets. 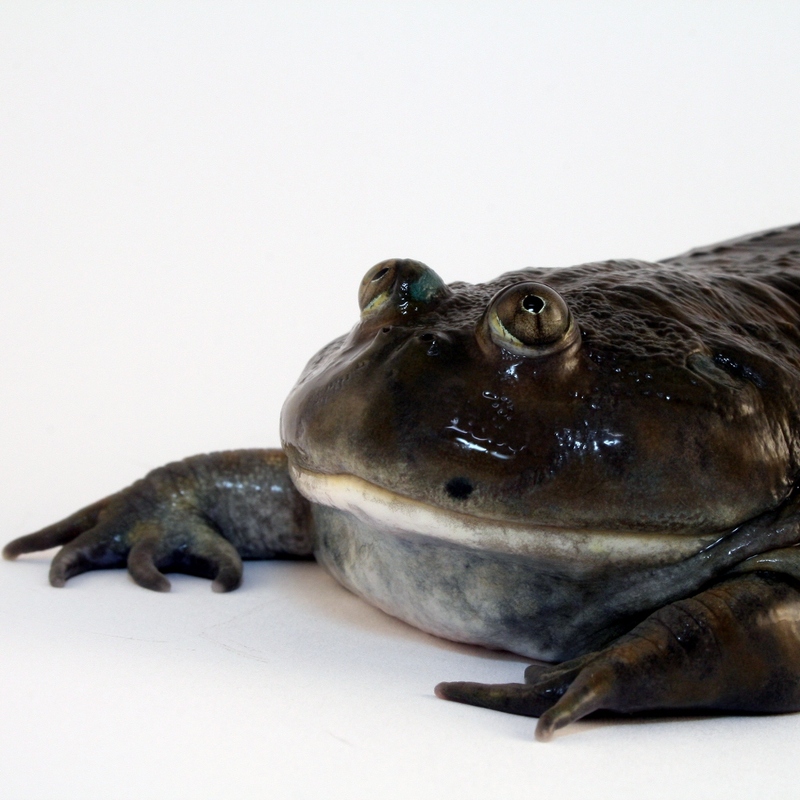 The Budgett’s Frog is an outstanding Amphibian; the wide face, odd proportions, and overall comical appearance coupled with their aggressive nature and big appetite makes for a fun and fascinating pet. In recent years they have become more readily available from commercial breeding with the use of hormones, with the increased availability comes a drop in price bringing them in-line with the price range of other ‘Fat Frogs’. I personally feel that complete novices are best to avoid Budgett’s. There is still a lot to discover about the optimal care for these hefty beasts but having first hand experience of aestivating other species such as the closely related and somewhat hardier Horned Frogs (Ceratophrys) will be a big advantage to those taking up the challenge. For those with a little experience, and more importantly the time and patience to properly research and learn about the natural cycles that these frogs face in the wild, the task of mastering their somewhat complex care requirements can make a very rewarding project.